There is no better place to go “wet and wild” or to chill on the sandy shores than Inishowen Peninsula. Lakes, rivers and sea offer excitement and adventure or pure peace and tranquillity. The choice is for the discerning visitors to take. The peninsula is traced by a scenic route now forming a part of “The Wild Atlantic Way”. Visitors can sample the many water activities en route or indulge in their chosen passion in a specific location. The water sports include surfing, diving, and snorkelling, kayaking, canoeing or angling. Start unwinding at Inch Island; see the Whooper Swans, of international fame and other sea birds from the causeway. Birds lighting on the water, stirs the imagination and frees the mind. Let the vacation begin, chill, or thrill! At Fahan, the Lough Swilly Marnia provides anchorage for 400 yachts and boats of all sizes; a great stop for boat enthusiasts. The onward coastal drive presents spectacular oceanic views across the Atlantic to Fanad Head. 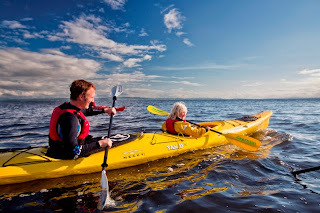 At Buncrana (Gaelic for “Lake of the Shadows”) the friendly staff at the tourist office will guide and advise on water activities to ensure their adventure unfolds and fulfils their expectations. 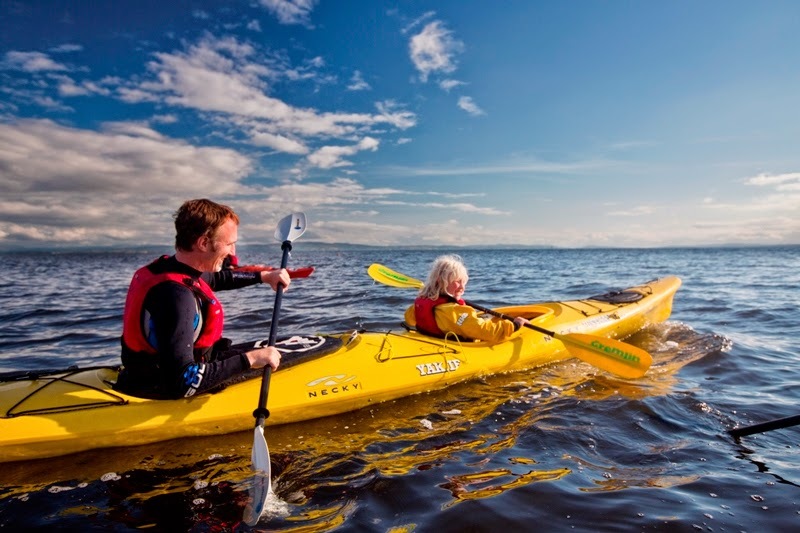 Whether you would like to surf the waves along the many sandy beaches that hug the shores in Buncrana right round the peninsula to Moville, adventure centres are ready to rock your world with a host water exploration experiences. Feedback from a visitor to Inishowen stated “Yet again we have spent the day out at sea in a boat... Whether it's been canoeing, sailing or out in a kayak it has been great and today taking three teenagers gorge walking it was a hoot. The staff were friendly and professional and installed great confidence in all those taking part; loved it and would recommend to anyone!” The Sea Symposium, in April is ideal if visitors fancy a weekend dedicated to Sea Kayaking.You will sure get the bug to return to the ocean, or ride the rapids on the river, catch a fish from a day trip in a boat, or canoe in and out of the nooks and crannies of the jagged coastline of Inishowen. With a surf school in Buncrana to memorable Inish adventures in Moville. Start the journey around the peninsula with some suggestions right here for “all on the water experience”, Leenan has a beautiful beach and harbour used by local fisherman and anglers, at Drumfries, lake fishing for trout is on offer, Malin Head with its rugged seascape invites sea-fishing, Glengad is a fishing port sight of the Malin Sea Angling Festival. Culdaff Bay is frequented by anglers and watersport enthusiasts alike; boat hire and pleasure trips are available from the Bunagee Pier. There is Salmon and Trout fishing in Culdaff River. Local fishermen catch Lobster, Crab, Sea Trout, Pollock and Plaice. Various Fishing Festivals are held throughout the peninsula every year and the Sea-Angling Festival in Culdaff in July. The Waters off Culdaff Bay, North Inishowen and surrounding areas have the best diversity of Marine Life that Ireland has to offer; native marine species to the largest fish in the sea - The Basking Shark which visit Inishowen waters every summer. Chance to catch fresh fish for the supper the sun will go down on breathtaking scenery, and stories to share in your local bar in the evening! Places of interest not to be missed on the return route include Kinnego Bay, sight of Spanish 16th century shipwreck; Stroove Bay Lighthouse with picnic sight; Greencastle Fishing Port with Maritime Museum; and Redcastle Yacht Club, and finally Quigleys Point, a centre for shellfishing . An annual regatta is held at Moville every year in August, and has done so since the early 19th century. Watch the racing of the Foyle punts, the race of home made rafts, yacht race which brings competitors from many countries. Round off the season with the Crana Fest in October, preparations are well on the way for a weekend of sea, lough and river kayaking at the 6th annual Crana Canoe Weekend. For getting here and staying here, contact us at www.visitinishowen.com and don’t forget to call by!